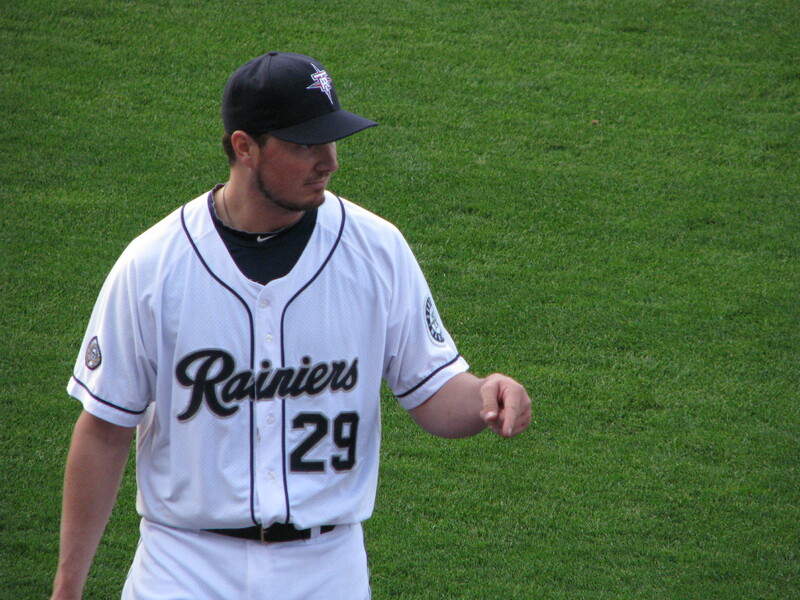 I went with some friends to Tacoma yesterday to watch Erik Bedard start a game against the Portland Beavers. This article from the times has a nice technical summary of the game. Marc W from USS Mariner was also there, and he was liveblogging through the event. Due to some severely heavy traffic we missed warmups, and due to needing to satiate my erratic addiction to corn dogs I missed the first pitch, but was in my seat to watch Bedard throw 81 pitches for 4 & 1/3 innings until he was pulled with two men on and relieved by Chris Seddon. 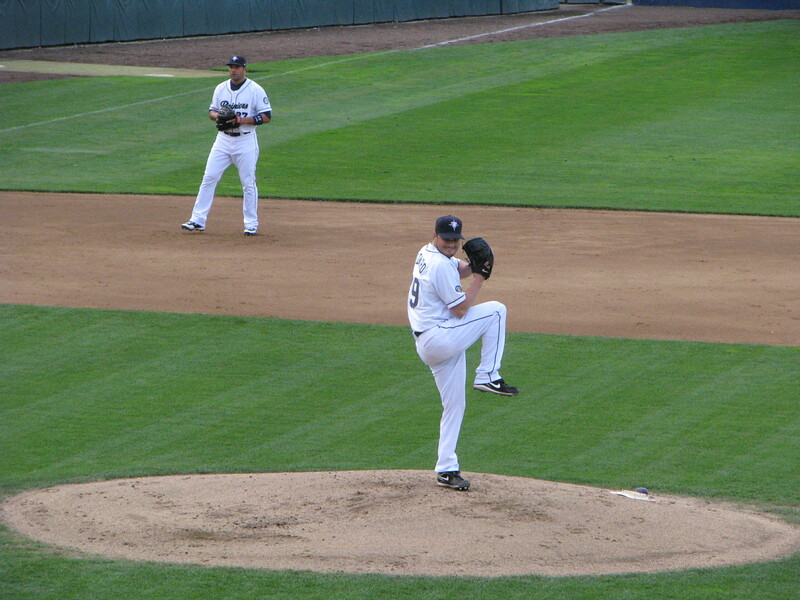 Portland seemed to be in a bunting mood yesterday, and it caused Bedard some trouble. 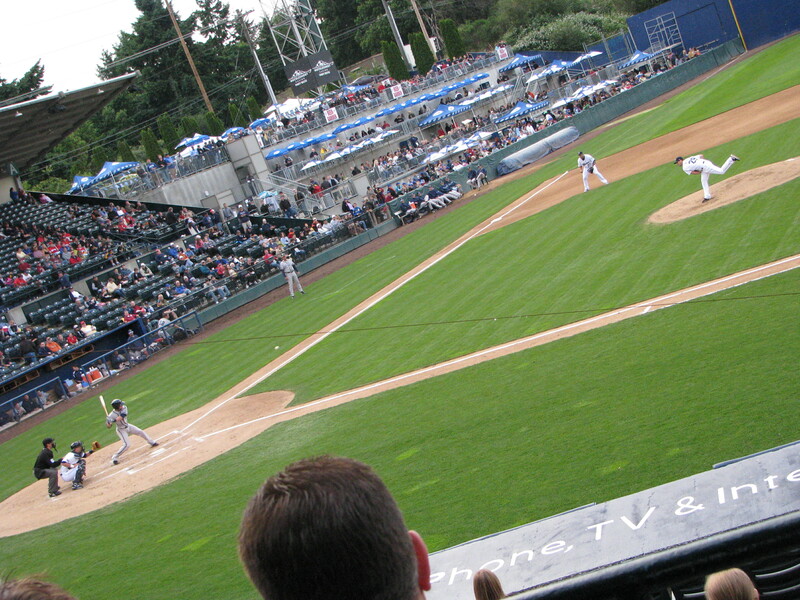 We had to leave shortly after Seddon threw an inning or so, but I understand Tacoma won 2-1 after a home run hit by Greg Halman, so good for them. I could never get smiley Bedard, no matter how hard I tried. I’m not sure I ever have been able to capture it on film. Or whatever it is that goes on inside a digital camera. 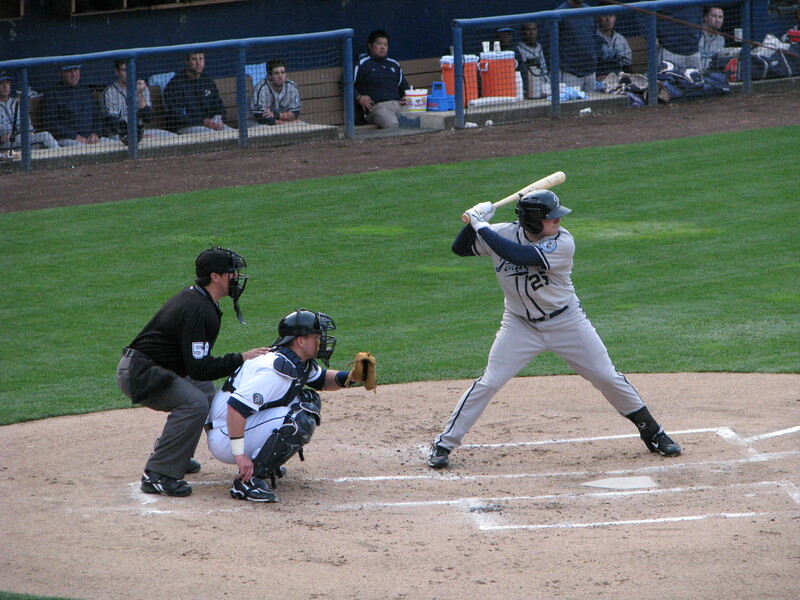 Matt Tuiasosopo takes a hack. The “sliding catch” referred to in the Times article linked above was really far more impressive than the writer let on. Not only was it Matt Tuiasosopo sliding quite some distance along the third baseline in the grass to make a catch, but the slide nearly took out Adam Moore who had either been called off by Tui, or lost the ball in the sky. 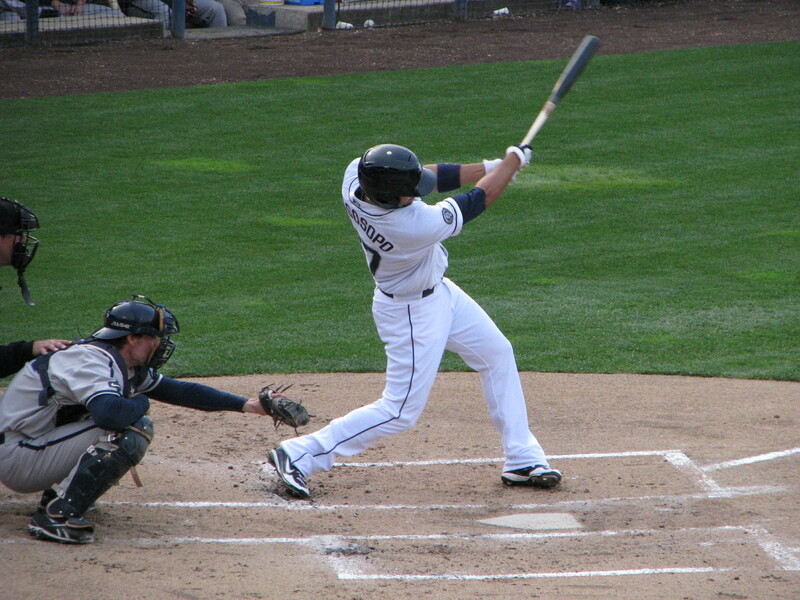 It was almost Ichiro-like. I’m glad I was there to witness it, as its equal may never be seen again. 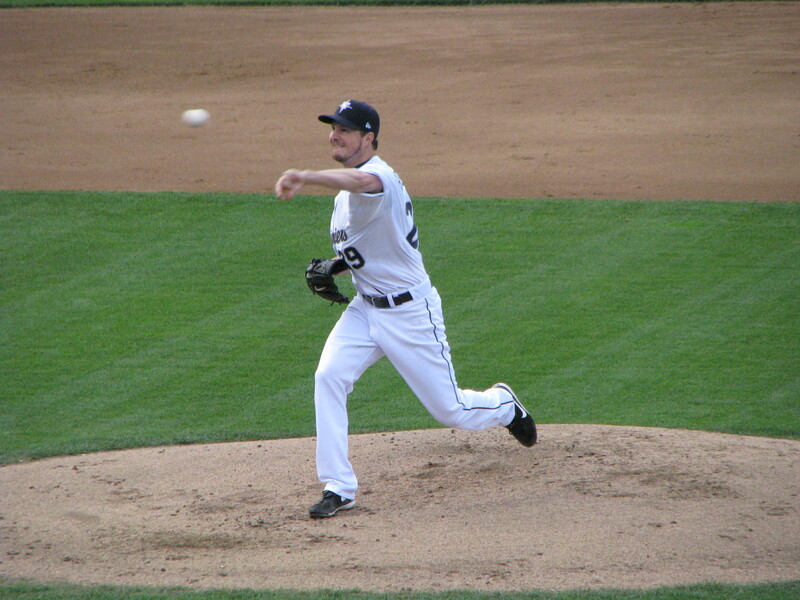 Erik Bedard and his Magnificent Pitch Face. He really does look like he wants to gnaw his bottom lip right off. Adam Moore was behind the plate last night, and there was a conspicuous absence of passed balls. It’s funny how you never appreciate some things until they’re not there. Until I get a new camera, this is the only way I can get any sort of wide-angle shot. It works for the time being, but it is extremely awkward. I don’t know what could have been said, but Bedard had just gone back to talk to Tui after the latter allowed an outfield grounder past his dive at third base. I’d hazard a guess it wasn’t anything pleasant, but I’d like to think teammates are nicer to each other than that. 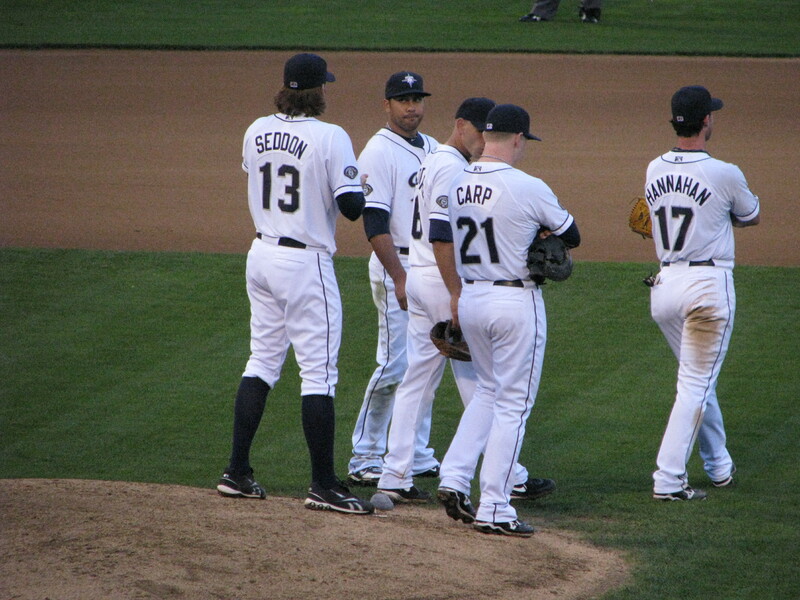 When the entire team comes to the hill in Tacoma, someone’s being replaced. Erik Bedard got a standing ovation from those of us who knew who he was and why we were there. The people in the row in back of us seemed to have no idea what was going on, nor did several others around the stadium. 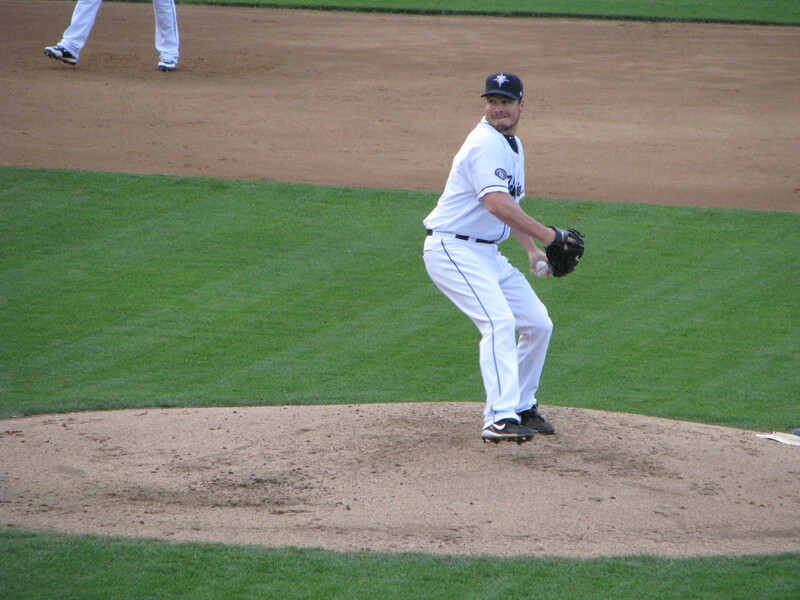 To them, Erik Bedard was just some other minor league schmoe, just another Tacoma Rainier they’d never heard of before, something to watch while they chowed down on cheap hot dogs and beer. 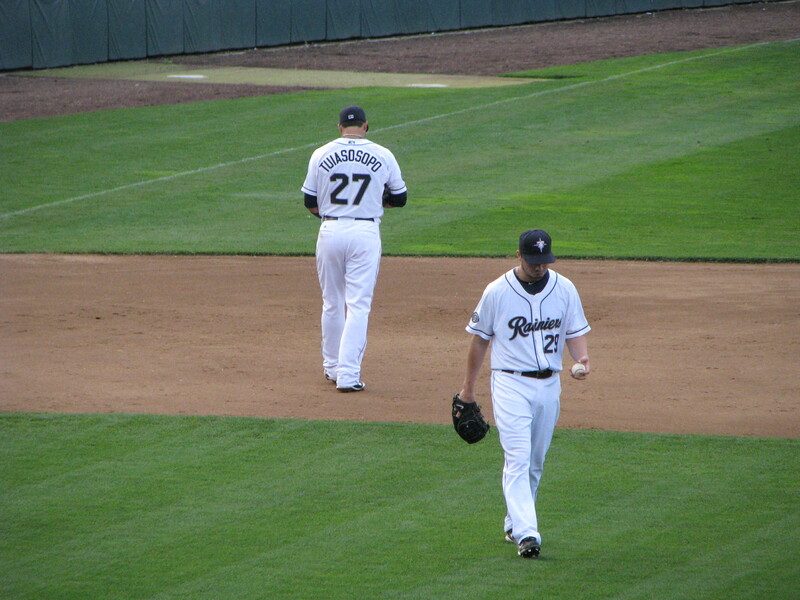 To his credit, before the two-men-on-one-out situation that got him removed from the dirt, Bedard was sparkly good. He only walked two, and I thought his pitch speed and location were pretty decent for a guy coming off what surely must have been extremely painful surgery. I realized upon waking up this morning, however, that the Cliff Lee and Felix Hernandez complete games, the Doug Fister and Jason Vargas 7-8-inning starts, those things are spoiling me as far as what I expect from a major league baseball pitcher. And I know that Erik Bedard, as good as he is, will not provide that same sort of longevity, not now, not ever. He’s supposed to start this next Tuesday. It’s just the Kansas City Royals. 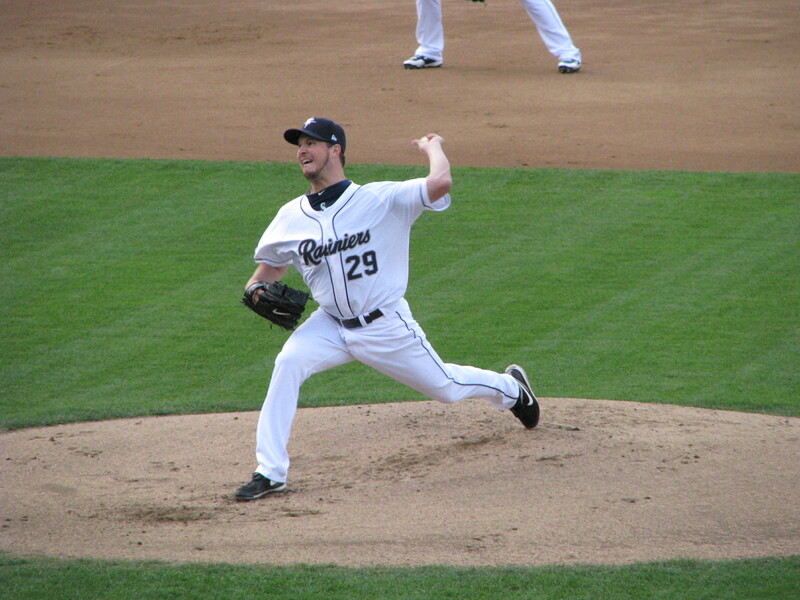 But for as nice as it was to see him back on the mound again yesterday, I have to keep reminding myself that it was also against Triple A ballplayers. One could make the argument that the Royals are Triple A ballplayers, but the fact is, it’s a major league start, and I’m a little worried about it. As always, I’d love to be proven wrong. I don’t want to end on a down note, and I’m really not as negative about this as I sound, I swear. Our current rotation has just been giving me flowers and buying me dinner for so long, it’s going to be hard getting used to having to drive myself to the date once in a while. But I’ll still do it, because that’s how I roll. It’s been over a month (and much has happened since), but still wanted to thank you for sharing the pictures and your impressions of the outing. Certainly it doesn’t matter now, but I didn’t get the feeling that he was ready to return after just three rehab starts. Still, would have much preferred to see him struggle some in the majors than to have him go through what he is enduring now. At least it is the best of the bad things that could have happened, and with luck he can come back next year.